Group Chair: Prof. Giuseppe Caire, Ph.D.
Giuseppe Caire was born in Torino, Italy, in 1965. He received his B.Sc. in Electrical Engineering from Politecnico di Torino (Italy), in 1990, his M.Sc. in Electrical Engineering from Princeton University in 1992, and his Ph.D. from Politecnico di Torino in 1994. He was a recipient of the Associazione Elettrotechnica Italiana‘s G. Someda Scholarship in 1991, and was a post-doctoral research fellow with the European Space Agency (ESTEC, Noordwijk, Netherlands) from 1994-1995. 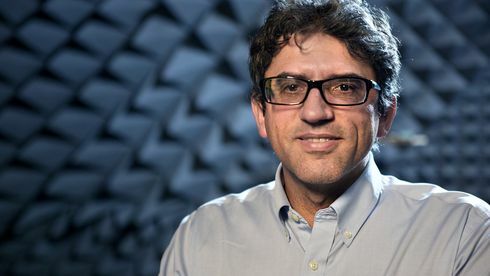 He has been an assistant professor in Telecommunications at the Politecnico di Torino, an associate professor at the University of Parma (Italy), and a professor with the Department of Mobile Communications at the Eurecom Institute (Sophia-Antipolis, France). He is currently a professor of electrical engineering with the Viterbi School of Engineering at the University of Southern California, Los Angeles, and an Alexander von Humboldt Professor with the Electrical Engineering and Computer Science Department of the Technical University of Berlin. He served as associate editor for the Institute of Electrical and Electronics Engineers (IEEE) Transactions on Communications from 1998-2001 and as associate editor for the IEEE Transactions on Information Theory in 2001-2003. He received the Jack Neubauer Best System Paper Award from the IEEE Vehicular Technology Society in 2003, and the IEEE Communications Society & Information Theory Society Joint Paper Award in both 2004 and 2011. Giuseppe Caire has been a Fellow of IEEE since 2005. He served on the Board of Governors of the IEEE Information Theory Society from 2004 to 2007, was an officer of the society from 2008 to 2013, and was president of the IEEE Information Theory Society in 2011. His main research interests are in the fields of communications theory, information theory, and channel and source coding, with a particular focus on wireless communications. Giuseppe Caire is included in the Thomson Reuters list of "The World’s Most Influential Scientific Minds for 2014". Google Scholar Profile from Prof. Caire may be found here. VIDEO: To watch a YouTube Video from the Alexander Humboldt Foundation about Giuseppe Caire click here. M. Bayat and R. K. Mungara and G. Caire (2019). Achieving Spatial Scalability for Coded Caching via Coded Multipoint Multicasting. IEEE Transactions on Wireless Communications, 227-240. M. N. Boroujerdi and S. Haghighatshoar and G. Caire (2018). Low-Complexity Statistically Robust Precoder/Detector Computation for Massive MIMO Systems. IEEE Transactions on Wireless Communications, 6516-6530. M. Bayat and C. Yapar and G. Caire (2018). Spatially Scalable Lossy Coded Caching. 2018 15th International Symposium on Wireless Communication Systems (ISWCS), 1-6. X. Song and S. Haghighatshoar and G. Caire (2018). A Scalable and Statistically Robust Beam Alignment Technique for Millimeter-Wave Systems. IEEE Transactions on Wireless Communications, 4792-4805. M. Barzegar Khalilsarai and S. Haghighatshoar and G. Caire (2018). How to Achieve Massive MIMO Gains in FDD Systems?. 2018 IEEE 19th International Workshop on Signal Processing Advances in Wireless Communications (SPAWC), 1-5. S. Haghighatshoar and P. Jung and G. Caire (2018). Improved Scaling Law for Activity Detection in Massive MIMO Systems. 2018 IEEE International Symposium on Information Theory (ISIT), 381-385. S. Haghighatshoar and M. B. Khalilsarai and G. Caire (2018). Multi-Band Covariance Interpolation with Applications in Massive MIMO. 2018 IEEE International Symposium on Information Theory (ISIT), 386-390. Haghighatshoar, Saeid and Jung, Peter and Caire, Giuseppe (2018). Improved Scaling Law for Activity Detection in Massive MIMO Systems. 2018 IEEE International Symposium on Information Theory (ISIT). IEEE, 381–385. M. B. Khalilsarai and S. Haghighatshoar and X. Yi and G. Caire (2018). FDD Massive MIMO: Efficient Downlink Probing and Uplink Feedback via Active Channel Sparsification. 2018 IEEE International Conference on Communications (ICC), 1-6. X. Song and S. Haghighatshoar and G. Caire (2018). An Efficient CS-Based and Statistically Robust Beam Alignment Scheme for mmWave Systems. 2018 IEEE International Conference on Communications (ICC), 1-6. S. Haghighatshoar and G. Caire (2018). Low-Complexity Massive MIMO Subspace Estimation and Tracking From Low-Dimensional Projections. IEEE Transactions on Signal Processing, 1832-1844. S. Haghighatshoar and G. Caire (2018). Signal Recovery From Unlabeled Samples. IEEE Transactions on Signal Processing, 1242-1257. M. N. Boroujerdi and S. Haghighatshoar and G. Caire (2018). Low-complexity and Statistically Robust Beamformer Design for Massive MIMO Systems. WSA 2018; 22nd International ITG Workshop on Smart Antennas, 1-8. X. Song and S. Haghighatshoar and G. Caire (2018). A Robust Time-Domain Beam Alignment Scheme for Multi-User Wideband mmWave Systems. WSA 2018; 22nd International ITG Workshop on Smart Antennas, 1-7. M. Bayat and R. K. Mungara and G. Caire (2018). Coded Caching in a Cell-Free SIMO Network. WSA 2018; 22nd International ITG Workshop on Smart Antennas, 1-8.